A mall in Dumaguete City, Negros Oriental is currently getting a lot of flak for allegedly refusing to let a person with a disability (PWD) enter their premises. 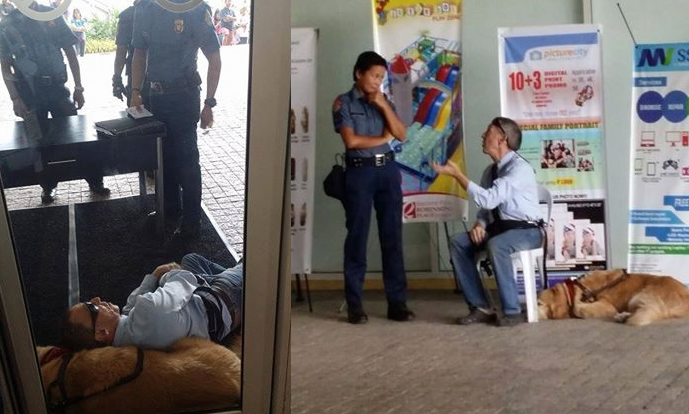 Mark Cohen, a Canadian national who just arrived in the Philippines with a plan of retiring in the country went to Robinsons Place in Dumaguetewith his assistance dog Happy but they were denied entrance into the mall by security guards. The mall has a policy stating that pets aren't allowed inside the main mall. According to reports, Cohen was denied entrance to the mall twice - on August 17 and on August 27. Cohen claims that he's a medically-certified person with a disability. He says that he is suffering from a neurological disorder which necessitates him employing the services of an assistance dog commonly referred to as a guide dog. He is not blind, he says, but he suffers from symptoms similar to epilepsy and Parkinsonism. He adds that without an assistance dog, he won't be able to function socially. In a letter he wrote addressed to Robinsons Place, Cohen said that he was denied access to the Dumaguete branch of Robinsons Place. The mall's security guards also called the local police claiming that Cohen was disturbing the peace. In the same letter, Cohen stated that the police arrived, handcuffed him and took him to a nearby police station. He was later released. A similar incident happened in August 27. Cohen tried to enter the mall with his assistance dog but was again denied from entering the premises. The mall's security guards were adamant in enforcing the mall's "no pets allowed" policy. A video of the incident was captured by Sam Du (the owner of a nearby coffee shop) and uploaded on Facebook. In the video, Cohen can be seen arguing with the guards and what looked like a female employee from management. Cohen can be heard pleading his case that he should be allowed inside because Philippine laws on PWDs give him the right to. (Left) Cohen and his dog lying at the entrance of the mall as protest for being denied access to the mall while several policemen watched over him. (Right) Cohen talking with another cop. Still not allowed to enter, Cohen decided to stage his protest by lying with his dog in front of the entrance. Police were called to the area and according to Sam Du, they carried Cohen back to a police car. In a statement posted on Facebook by Robinsons Place Dumaguete, the mall defended their treatment of the foreign visitor by reiterating that they don't allow pets inside the mall for the safety of all customers. The mall also claimed that the mall's management offered assistance to Cohen by offering to provide a nurse who would assist him while he's inside the mall. The statement said that Cohen refused the offer.